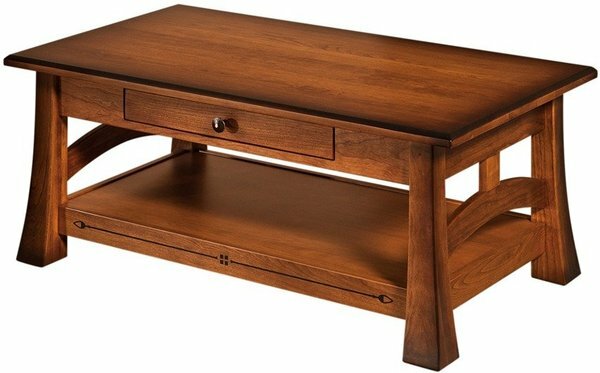 Bring the warmth of Amish Country to your living room with the help of our handcrafted Amish Brady Small Coffee Table. Gather around the beauty of a coffee table that was made just for your home. Create memories to last a lifetime with furniture that was built to last as well! The Brady features 5/8" thick maple dovetailed drawers. Its soft-close concealed hinges are both attractive and functional. Its 1" thick top is solid and sturdy. Enjoy dovetailed maple drawer boxes and premium soft close undermount draw slides. One of our favorite features of the Brady is the prominent tupelo inlays featured in the base. This element adds interest to an already gorgeous piece. With your choice of solid hardwood and stain combination, the Brady will be brought to life. Choose from our various selections of hardwood including homegrown oak, brown maple, and rustic cherry, to name a few. Pair the Brady Coffee Table with our Amish Brady Sofa Table for a completed Amish furniture look. Together, these pieces will set your space apart in style. Should you have any questions, we would love to hear from you! Please feel free to give us a call at 866-272-6773. Visit our Amish Furniture Store to see it all for yourself! I saw this sofa at a local Amish store in my hometown and I fell in love with it. I received the rest of the furniture on Sunday August 16th. They arrived in perfect condition. They are beautiful and it was worth the wait! My husband was very impressed. These will last a lifetime as they are of superior quality. I wanted to thank you for all the help and the excellent service you have provided. I will definitely purchase more furniture from Dutcrafters in the future.